Would you be bored with a small-ish wardrobe? 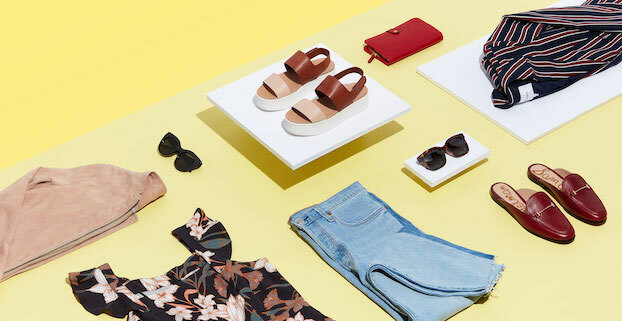 We women of style and taste, and a certain age, have been hearing for years that an edited closet/curated wardrobe/clothing capsule makes dressing easier. Agreed, yes, yeah, yawn. Well, when life gets extra interesting (“interesting” in that sense of the faux-Chinese saying, “May you live in interesting times”), a simple closet feels like one less thing to get worked up about. We are pulled in lots of directions, and as my psychology professors used to remind us, there will be a steady stream of stressful events in everyone’s life. I know you get it. -Hans Selye, endocrinologist and the “Father” of the field of stress research. I enjoy clothes. I love fashion and style. And I don’t want to get complicated about these things, much as I adore them. Over the last four years or so, since my retirement from paid work, I’ve been pruning the closet and adding just a few key things that truly are making life simpler. It works! 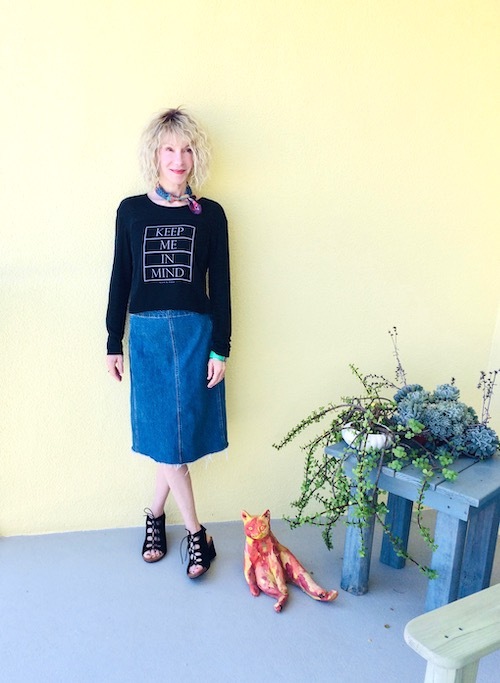 Every day last week, for example, I wore a black or navy graphic tee with a full black tulle skirt, or denim pencil skirt, tights and cool sneakers/sandals. I have several leather belts that pull the look together, and a simple denim jacket makes the perfect topper piece. I added a scarf a couple of times, mostly tied around my neck like a cowgirl. I always include a piece of vintage jewelry that means something to me. I feel stylish and current and stress-free, at least as far as my wardrobe goes. Here’s one example of my small-closet dressing. The green bracelet is vintage 80’s, thrifted in NYC. The silk neck-scarf is by Missoni, found in Filene’s basement about 25 years ago. When life enters a calmer phase, (ha! see the quote above) will I get bored with my small-ish closet? Maybe. But I think I will keep loving it, and just add a few new pieces per season, like those vaunted French dames. New-to-me shoes, scarves, socks, and other accessories are always welcome, to stave off tedium. Hot pink sandals will make all your outfits more cheerful. 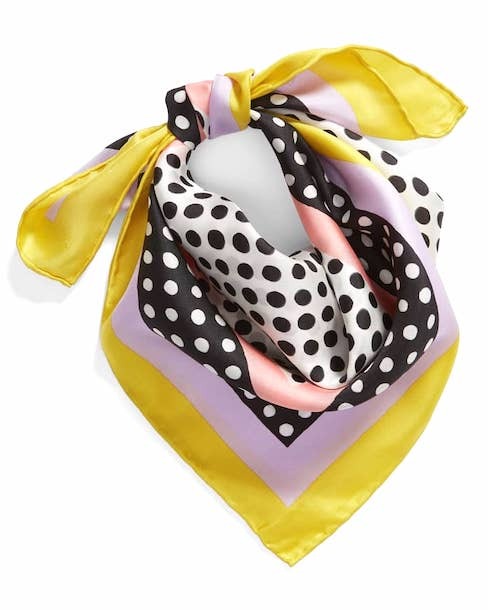 I love a small scarf with a cool print. Makes a pretty neck-tie or hairband. 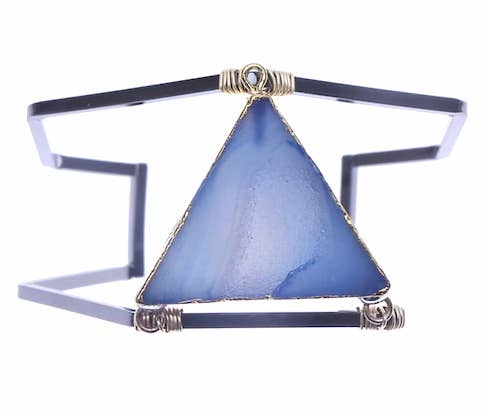 Here’s a cuff that makes a statement, against a simple outfit. How’s your tolerance for wardrobe boredom? Do you require an infusion of new, or recycle from the back of the closet, or re-fashion with your DIY skills? Or do you simply toss on a different scarf, a new lipstick, and call it a day? No wrong answers, of course! We all have our ways. This post was featured on Links à la Mode fashion roundup by Independent Fashion Bloggers. I love the graphic tee and this is the perfect outfit. The cuff is also beautiful. I think this all boils down to personal preference. For me, at this stage, I enjoy the variety of many kinds of clothing. However, I can certainly see the appeal of scaling things back a bit! Can I just say These shoes are absolutely adorable! I love strappy wedges. I have a VERY small wardrobe. As a short, apple-shaped senior citizen, I use the “column of color” concept. For spring/summer, I combine leggings in black, grey, or navy with matching tops, and finish with a denim jacket in indigo or white and a colorful scarf. I have 3 dresses and 2 skirts to wear with leggings or bare legs, a couple of cardigans, and a red trench coat. That’s it! It radically simplifies my choices and allows me to get dressed quickly. I think I would be happier with a smaller wardrobe, provided that the pieces were all interesting and could be put together in lots of creative ways. I have too many things to choose from and instead of being a joy getting dressed in the morning, it can become a time-consuming chore. I’m working on paring down! I think you know I love a large wardrobe, with infinite variety and ways to wear things in it. I wonder how that will change in 8-10 years when I retire? Will I chafe at not having anywhere to wear all my fun clothes, or will I find a way? Or will I gradually reduce it all down? Time will tell. Love your casual, cool vibe, Patti! You look wonderful. I put together a 30-36 piece capsule wardrobe every season (and sometimes I switch it monthly depending on the weather) and I don’t get bored. It’s nice when a season rolls around and I can reinstate some of my favourite pieces. I update with the odd new-to-me charity shop purchase, and I often donate things when they no longer feel ‘right’, so although I have a limited number of pieces, I never get bored, it’s fun to see how many ways I can wear something and always enjoy seeing how I can incorporate new pieces. I enjoy the creative process of putting outfits together and know I would find a capsule wardrobe limiting. Like you I have base pieces that are worn on rotation with a variety of shirts, tees and jackets. I must admit I enjoy finding interesting pieces and accesories to add to my collections. This is tough for me. I’m used to having so many choices but at the same time I can see it would be calming, one less thing to think about. I enjoy creating new outfits and with my shop I’m always getting new ideas. I think it would be interesting to see how I felt if I tried it for a month. Hell yeah!! I would miss the rush of oxytocin whenever I immerse myself in my ‘ward-chalet’ (yes it’s so frikkin big it needs it’s own little house ). Every single day I get to create another work of art with my cloth babies, and then tell the world what’s up with me today . Love the self-expression & creative outlet it gives, and the more options the better it is Do have an active thing going on with my own insta shop, selling pieces that I’ve finished playing with so there’s some movement! This is me! I love your attitude, Paula! Great post! We do think alike Patti. I am seriously thinking of a summer capsule wardrobe this year and started writing a post about it. However, I’m not sure I can handle just 37 items for a season. Boredom will surely set in. . . I do love that up cycled denim skirt on you, Patti! Small-ish, maybe. Small would definitely bore me. 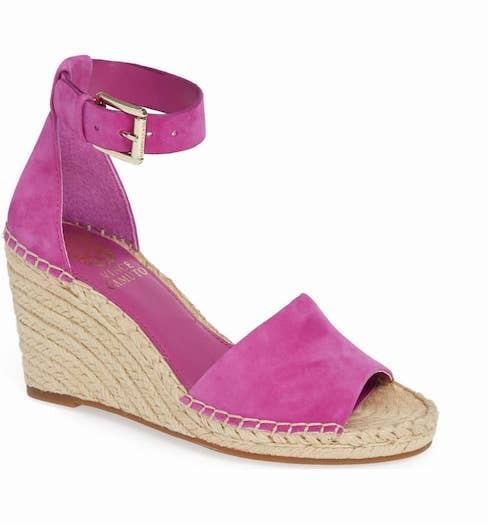 Looking forward to seeing how you style those pink espadrilles! I do everything! Constantly adding and subtracting items, if anything, I’m always trying to edit more!